So I hate to do this but the MUA eyeshadow palette I was going to put in my giveaway I literally can't find in any of my local Superdrug stores! 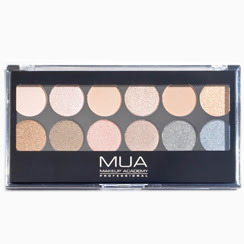 I've looked quite a few times and they never have it and with the giveaway ending on Thursday I've decided to change it to the new Undressed eyeshadow palette! Only 3 days left to enter so get onto it super quick if you havn't already!